You are in a tricky situation. You think that your friend or relative may be being abused in the very place that is supposed to keep her safe—her nursing home—and you don’t know what to do. Talk to the nursing home resident. Pay attention to both the resident’s words and her body language. Does she seem nervous or uncomfortable? Does her description of the event that concerns you make sense? Visit your loved one as much as possible…without calling in advance. This puts the staff on alert that you are actively engaged in your loved one’s life and concerned with his or her well-being. It also allows you to see what is happening at different times of day and with different staff members on duty. Record the information you know. This may include the victim’s name, the victim’s age, the name of the nursing home, the date and time of the suspected incident, a description of the incident and contact information of any witnesses. Keep notes about any behavior or signs of abuse that you witness. Documenting bruises or sudden changes in personality may be used as evidence if it should become necessary. Take pictures of any dangerous conditions or physical signs of abuse. Things such as bedsores, broken bones, bruises, weight loss, or dehydration may be visible. Pictures speak a thousand words and it is important for juries to see the injuries from the abuse if possible. Get the suspected victim the services she needs. This may include a new living arrangement or around the clock care. 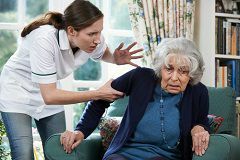 Elder abuse is a terrible and heartbreaking crime; the actions you take now matter. If your loved one is in imminent danger, then you should call 911. Otherwise, you should take the steps described below. Taking the right steps could make a huge difference for the residents of the nursing home and for your loved one’s recovery if you decide to pursue legal action. If you suspect abuse, then you should not alert the media or confront the staff member whom you think committed the abuse. Discuss your concerns with the supervisor or manager of the nursing home facility first. Be sure to remain calm and allow the nursing home the chance to hear your allegations. The nursing home administrator needs to know about it so that immediate protection can be provided for anyone who is at risk. You should document this report. If you do it in person or over the phone, then follow up with an email or written letter thanking the home administrator for her time and recapping what was said. Call your loved one’s doctor. Make sure that your loved one’s injuries are examined, diagnosed and treated as soon as possible. Contact the Department for Community-Based Services (DCBS) in Kentucky. DCBS will work with local agencies and law enforcement to do whatever is necessary to protect your loved one. The number for the adult abuse hotline in Kentucky is (800) 752-6200. Call the Kentucky Inspector General’s office and report the abuse. This agency will do its own independent investigation. You can call (502) 564-2888. You can also contact the Office of the Ombudsman. The Kentucky Long-Term Care Ombudsman program advocates for the safe care of nursing home residents. You can reach this office by calling (800) 372-2991. Contact a Kentucky nursing home abuse lawyer if you believe that legal action is warranted. You may be entitled to file a claim against the liable party. Your lawyer can take actions to put the nursing home on notice to preserve evidence that may be at risk of being “lost” or destroyed. Do not sign anything until you’ve spoken with a lawyer. If you believe that an elderly or disabled Kentucky nursing home resident is being abused, then you should report your suspicions to the government. Your call may be placed anonymously. Your obligation is to report suspected abuse. Your action is meant to trigger an investigation by the government to determine whether or not abuse of a specific resident (or residents) is occurring in a specific nursing home. The law does not require you to be right. Instead, it requires you to have reasonable cause to make the report. Nursing home abuse victims may be unable to report the abuse themselves. They may be afraid for their safety. Thus, it is important for you to speak up if you think abuse or neglect may be occurring. Your actions could protect nursing home residents from pain, humiliation, and significant physical injuries.